It is hard to find more bang for your buck than a LED retrofit will provide. You can read up on the cost savings in our previous blog post and see some numbers. The LED market has now become nearly comparable in cost with incandescent, fluorescent, as well as HID fixtures and the options are unlimited. Here are some questions to ask yourself before requesting a quote. 1. Are you pleased with the look and layout of your existing fixtures? If so, then a simple replacement of the lamp with a new LED type lamp would be a quick and easy retrofit. If not, then you'll want to consider changing the entire fixture to a new modern LED fixture entirely. 2. Are you pleased with the current amount of light? If not, you'll need to consider adding more lighting locations, changing the layout or increasing the amount of light with larger lumen output. 3 What is the voltage of your current lighting? Voltage is another important factor in planning your retrofit. Typically, LED lamps have a self-selective range of 120v-277v, this will cover the majority of your standard lighting needs and usually have the shortest lead time to obtain. If you have a 480v lighting system there are additional cost involved along with longer lead times on receiving the lighting package. 4. What color lighting do you want? These color temperatures are expressed by a kelvin rating or "k-rating". Most LED lighting comes in a standard range of 3000k-6000k. The lower kelvin rating will provide a warmer light (yellow/orange tone), similar to a traditional incandescent lamp. The higher the kelvin rating, the whiter or even bluer your lighting will become. 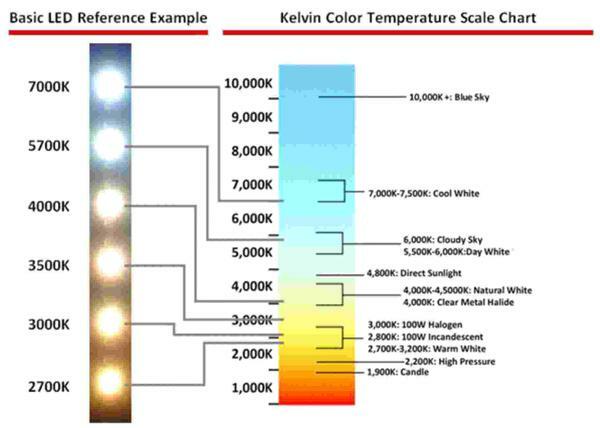 The chart pictured below will provide a visual assessment of the LED color scales available. Now that you have the information necessary, all that remains is deciding if a retrofit is right for you. The most common interior retrofits are performed on standard 2’x4’ fluorescent lay-in type fixtures or recess can lighting in your office areas and high-bay fixtures in a warehouse/storage area settings. In an office setting the color temperature will come down to personal preference. While in a lab or manufacturing environment you will want to install lamps with a higher kelvin rating to provide a percieved brighter or "whiter" work environment. 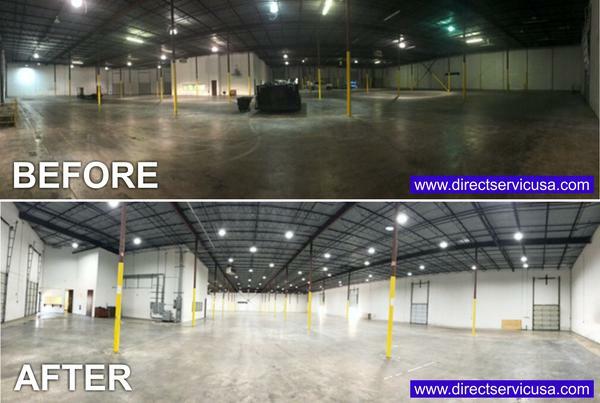 Below is a recent interior warehouse lighting upgrade we performed for a manufacturing facility, the end result is quite literally night and day. Exterior lighting upgrades will not only enhance the value and appeal of your property, they will provide you with a much safer environment. A well-lit exterior will help deter the wrong people from loitering around your property as well provide you and your employees with enough lighting to feel comfortable entering or exiting the property. Aimable flood lights for signage and flag poles. Exterior lighting is typically specified at a higher kelvin rating and in most situations a "whiter" light is desired. More so than your interior lighting, voltage will be slightly more critical in the design of your LED exterior lighting. Though there are plenty of options for any voltage you have available. The 480v retrofit will have additional cost involved, and at times it will make more sense financially to replace the fixture with an LED model as opposed to performing a retrofit of existing fixtures. Either way, the end result will be an upgrade to the function and aesthetics of your lighting system. Would you like to discuss an LED Retrofit or Installation? Email us now and let's create a custom solution for your business or home. *This free report has been provided by Chris Svarplaitis / Project Manager: www.directserviceusa.com - 1.866.3.DIRECT. | The Rice-Tinsley Corp. 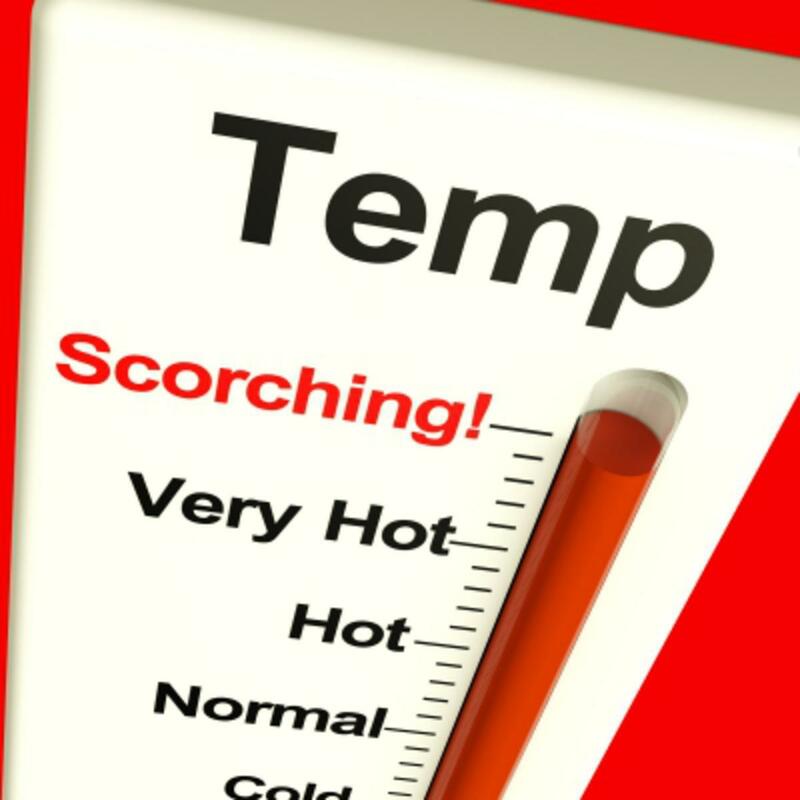 Maintaining your heating, ventilation, and air conditioning (HVAC) systems is essential to keeping them operating properly, dependably and efficiently. Think of preventative HVAC maintenance in the same way as preventative maintenance (PM) for your car: if you don't change the engine oil and replace belts and filters regularly, the engine will lock up and the vehicle won’t operate. The same holds true, in a sense, for HVAC systems. If you spend $30 on an oil change in your car, it can save you $3,000 on a new engine. Proper PM for your HVAC system can provide the same benifits. HVAC system maintenance isn’t expensive compared to what you might spend if your system degrades (and ultimately fails). By tracking different system indicators, we can pick up on many emerging problems before they reach a crisis situation. Properly maintained HVAC systems typically last 2-3 times longer than systems that are not properly maintained and replacement costs far out way PM costs. Maintaining your HVAC systems will help reduce operation costs and energy consumption by allowing your equipment to operate under minimal stress. Get your AC and heating sytems on a routine service plan and maintain your equipment properly as they we're designed to be. I recommend quarterly for commercial applications and bi-annual for residential properties. Do you need a quality heating, ventilation, and air conditioning contractor? Email me now and let's create a custom solution for your business or home. *This free report has been provided by Ronnie Tinsley, COO / Co-Founder: www.directserviceusa.com - 1.866.3.DIRECT. Copyright 2013 - The Rice-Tinsley Corp. Here's 6 cost saving tips for keeping your facilities running smooth. Today’s property management market is fiercely competitive. Building owners and property management companies are faced with ever tightening budget constraints while maintaining properties in order to remain competitive and profitable. Tip #1: Perform continual self evaluations of your properties on a regular basis in order to identify problem areas using a self created basic check list geared towards your specific property. Tip #2: Respond to your self evaluations with planned actions and preventative maintenance programs to avoid costly repairs and untimely facility or system failures. Tip #3: Tackle the little things first and prepare budgets for larger repair items. Often it's the little repairs that cause bigger problems if left unchecked. Tip #4: Prioritize your facility needs and work towards quickly resolving issues as they arise. Tip #5: Be proactive as opposed to reactive in repairing distressed or inoperable systems. Tip #6: Commission an energy audit on your facilities power and utility consumption. If your building is more than 2-3 years old it's important to recognize that modern technology has come a long way in the past few years and is always evolving. There are many ways to immediately reduce operational utility costs but you will never know unless you get some help in identifying these potential savings from real industry professionals. Based on our years of experience, we have analyzed our customer’s data and determined these tips actually reduce costs in the long run. We’ve prepared this report in order to highlight some important steps that all effective property managers and building owners should consider for successfully mitigating maintenance issues, keeping their facilities performing at maximum level while not breaking the budget with unplanned emergency repairs. Do you need a quality Mechanical, Electrical, Plumbing and/or Maintenance Contractor? Email me now and let's create a custom solution for your business or home. Here are 6 reasons to consider the switch to LED lighting. LED light bulbs, fixtures, and components are more energy efficient. Because LED lighting is "digital", once installed and operational you will see an approximate 70-90% reduction in energy consumption for your lighting systems. Ultimately this reduces the amount of wiring needed to support your lighting system during installation as well as your monthly utility bill. LED light bulbs and fixtures have a longer life span. So now you have your nifty little curlycue compact fluorescent screwed into your lamp or recess can, congratulations, welcome to 1998. Chances are you're going to get about 8,000 hours out of that bulb. Fast forward to now; with current LED technology in mass production, you can potentially see average life spans for your lighting of 40,000 to 100,000 operating hours. On the low end, if my math is correct, you're looking at about 13-14 years, up to 34 years (give or take a year), if you're burning your bulb 8 hours a day. LED lighting reduces your electricity bills. LED lights use far less power (watts) per unit of light (lumen) generated. Some LEDs produce 100 or even up to 200 lumen per watt. Compact fluorescent lamps use about twice the wattage and incandescent lamps around 10 times as much power with only 18-20 lumen per watts. This equates to the 70-90% reduction in energy consumption I mentioned earlier. In conclusion, LED lighting is almost 50 times more efficient in life span and 70-90% more energy efficient than a conventional incandescent lamp. LED lighting is "Green". Not green as in "Honey why are all our lights green?". Green as in, they aren't loaded with mercury and other toxic chemicals that require a hazardous waste response team to properly dispose of them if you drop one on the kitchen floor. All LED components are 100% recyclable. They're also green in that they save energy, which saves emissions down the street from you at the local power plant. LED lighting is more flexible in design. With LED lighting you can have various color variations and lighting effects that you simply cannot have with traditional lighting. Honestly, it looks just like the lighting you're already used to staring at so aesthetically there are no issues with LED lighting to be concerned with. LED lighting is cheaper to maintain. LED lighting doesn't have expensive ballast or components that are traditionally found in fluorescent and HID Lighting and since they last so much longer, you won't be on the hook for repairing them every 2-5 years as you are with traditional lighting. Ultimately, you're going to save on some serious electrician service calls and parts in the long run, on top of the energy savings you get with LED. A typical service call to repair a 400 watt metal halide wall pack exterior light for example may run you 1.5 hours labor for an electrician, plus parts, plus a bucket truck, etc. The cost would range between $150-$250 and this will more than likely need to be repeated every 2-5 years. You do the math. LED lighting @ 34 years vs. traditional lighting with head-aches far too often. What's the catch? Your up-front costs on the LED light bulbs or entire fixtures are at least 1.5-2.5 times more expensive than traditional light bulbs and depending on the application can be even higher. It is important to note that the payback on LED lighting is there and out of all the energy reducing cost cutting measures available in the world today, a simple LED lighting retrofit is by far the least expensive means to save money quick. Do you need a quality electrical contractor for your LED lighting needs? Email me now and let's create a custom solution for your business or home. Attract more clients or improve your employee benefits for free with our affiliate program. As an employer or someone with customers to manage, do you ever wonder what you can do to make your business more attractive to them? Everything you can possibly dream of has already been done and it probably costs something to implement. How about an affiliate program with us? Step 1: Identify your clients or employees that you'd like to reward that could also benefit from using our services. Step 2: We'll give you discount advantage for you to pass along that can go a long way and will mean a lot to them while making you look like a hero. Step 3: We will print up a simple little business card, letter or a custom package for your employees or clientele. Step 4: Attach these discount cards, letters or packages to your new client presentations or proposals so your pitch has an extra benefit over your competitors. This may give you the extra edge you need to land the account. Likewise, for your employees, add them to your new hire paperwork or put them in everyone's pay check envelope or employee mail box. For a more modern approach, use an email blast to your employees. Step 5: Spread the word! In your next marketing campaign, you can promote this new benefit to your prospective clients as well as new hires in order to have an added edge on the competition. Starting an affiliate program is easy. You can start today by offering discounted air conditioning, heating, ventilation, refrigeration, electrical, plumbing and maintenance services to all of your clients AND your employees by contacting me directly. Email me now and let's create a custom solution for your employees or clients. Contractors and service companies make more profit from your business when you are not informed. SECRET # 1: Preventative maintenance programs actually pay for themselves in savings and offer a greater return on your investment when compared to calling contractors out on an as-needed basis. SECRET # 2: Most contractors simply won’t report areas of concern because they feel it is future “job security” for them if your systems continue to fail. In that regard, they usually don’t have your best interest's in mind. SECRET # 3: Contractors make more profit on service work when you “react” to a problem, especially during emergencies. When you are “proactive” about problem identification and resolving them promptly, contractors have to remain competitive. SECRET # 4: With a simple check list, you can spend a few hours a month identifying problem areas yourself and prevent most major problems from occurring by taking proactive steps. SECRET # 5: Most contractors don’t want you to know that if you take care of the “little things” first, you’ll prevent “major things” from happening and avoid systematic building and system failures. SECRET # 6: Most contractors don’t offer energy-auditing services because they simply don’t know how to perform them. Not knowing your potential energy savings from a commissioned audit could be costing you 10-70% in energy cost. SECRET # 7: Most contractors only perform a single trade service. 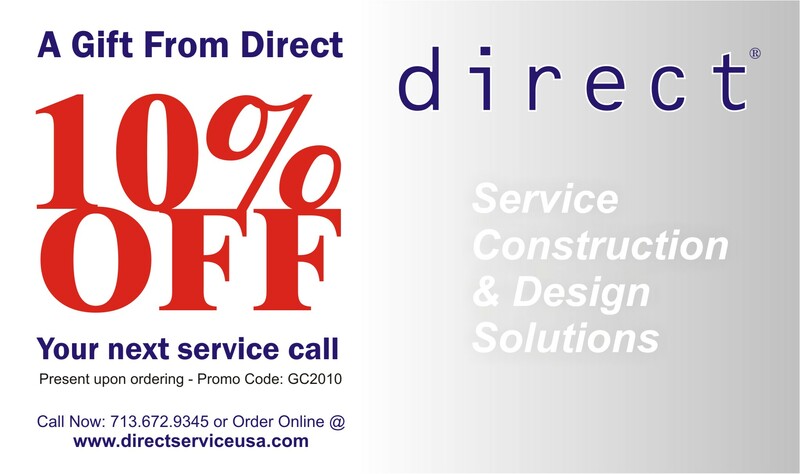 A multi-service company such as ours can provide discounted or “bundled” service, construction, and design solutions along with the conveniences of “one-stop shopping”. *This free report has been provided by Ronnie Tinsley, COO / Co-founder: www.directserviceusa.com - 1.866.3.DIRECT. Copyright 2010 - The Rice-Tinsley Corp.